Should College Teams Scrimmage Each Other? Spring game file photo from 2010. It's been a good spring so far for the Michigan football team. Based on the reports that have come across my desk, things seem to be humming along nicely after the first seven of fourteen practices. There are some major holes to fill along the offensive and defensive lines, among other battles, but it sounds like competition for those spots is as fierce as expected [offense, defense]. These next three days, starting today, will go a long way in helping the coaches figure out who the real contenders are. Michigan practices in full pads today, no pads tomorrow and then full pads again on Saturday. This three-day stretch also coincides with the high school coaches clinic being put on by the UM staff. It's an exciting time. As exciting as spring practice can be, I suppose. For us bloggers and fans, rumors and speculation can be fun. But what if spring could be exciting-er? As Angelique Chengelis writes, Hoke has said he's in favor of scrimmaging other teams in the spring. 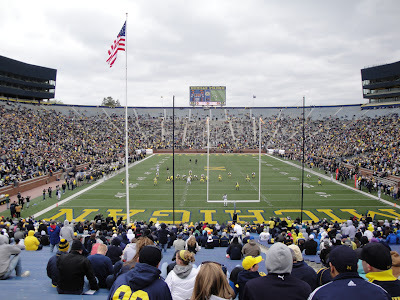 "I think that would be kind of cool," Hoke said Thursday afternoon when asked about scrimmaging other teams. "I've thought of it before. Whether we do like the NFL — different teams going to different places, interacting for two days, three days, off that model — I thought that would be kind of neat." I have to say, I've thought about this as well. Not scrimmaging in the spring, but rather in the summer, during fall camp when teams are fully dedicated to football and not in classes. It's almost a little strange to me that it doesn't happen. High school teams scrimmage...when I played we had two or three scrimmages before the season began. NFL teams scrimmage. So, why not college? Sure, getting to see your team kind of go hard at the end of a month of spring practice has its moments, but it's mostly a snoozefest for those in the stands. You usually don't learn a ton from spring games and the best players often skip them. But what if the NCAA decided to tweak these games. Maybe, let teams travel to other stadiums and actually play another team? Put it on national television and we're talking more money to spread around. I know, it sounds crazy, but you have to admit it beats seeing Team A collide with Team A over and over again. It actually makes a spring game watchable! Clemson head coach Dabo Swinney thinks television revenue would be huge, and it should all stay with the school or donated to charity (much like how UM's game is sponsored by C.S. Mott Children's Hospital). I also agree about that. “The good thing about doing something like this is that in the spring time, you don’t have your whole team there. Like last spring, for example, we were missing 31 guys for spring ball. So we were very, very thin. This year, we have more bodies on hand. But still, every time you practice against each other in a scrimmage, you’re 100-percent invested with your personnel, as opposed to if you go and scrimmage somebody else. You’re scrimmaging their defense, while your defense is on the sidelines. When your offense is out there, your defense is on the sidelines. You’re not 100-percent vested with what’s going on. I just think there’s something good with that. “Plus I think a scrimmage would be a great way to further teach our guys and prepare them for the season … to be able to implement your schemes against another opponent, and it could be against anybody. Obviously, I don’t think you should do it against a team in your conference. But anybody else … maybe the NCAA could put stipulations like it’s got to be a team within a 100 or 200 miles or something like that. Most everybody could find somebody to scrimmage against. It may never happen, or at least not anytime soon. But I like the idea. Frankly though, college football has bigger problems to deal with...like figuring out a way to get the two best teams to play each other for a championship. But it's still something worth looking at. Personally, I think this could be something that could start on the conference level...like an agreement between two conferences to do spring scrimmages between their member schools...the B1G vs. Pac-12 Spring Challenge or something like that. Have it over the course of three weekends in April with alternating locations year-to-year. Can you imagine this taking place back in 2008 when Rich Rod first took office? Bad news traveled fast when the spring game was closed to the public and held at Saline High School. Can you imagine live on BTN? I think it is a great idea. For instance Michigan schedules a four way scrimmage with Eastern Michigan, Cincinnati and Missouri. All three teams are from different conferences and they do not play each other during the regular season. Each team is allowed 15 plays and followed by another 10 plays after switching to defense. The 10 plays can be used for the backups. That will give each team a total of 75 plays. 45 plays for the first team players and 30 plays for the backups. This would allow coached to get a better evaluation of their players during the spring. Coaches can also put red jerseys on their QB's to protect them from getting injured if they decide to do so. Also limit the amount of blitz packages that can be used per scrimmage; say 5 per scrimmage.